Right now in my freezer, I am proud to report, there is still one full sleeve of Girl Scout Thin Mint Cookies. One afternoon right at the end of January, an adorable little neighbor girl showed up on our doorstep peddling the irresistible treats. And I wasn’t home. I say this because I don’t want to accept the blame for the ridiculous number of boxes we purchased. You see, my husband is a sucker very generous man, one of the many reasons I love him so much. He also has a competitive streak so when that shrewd little neighbor girl told him her dad had ordered seven boxes of Thin Mints, my man ordered EIGHT BOXES. The trouble with this is that he doesn’t eat them. He doesn’t even like them; he just knows I do. He did also order a box of his favorite Samoas, which is currently unopened in the pantry, but mainly he ordered cookies for me. Oh, no, no. I just meant one of the little green boxes. Oh, okay, I’ll just take them all. Of course. That makes sense. It’s good advice. I won’t sit down and eat the entire box, then. I’ll just eat one of the two little sleeves of wafer thin cookies. For now. Then I’ll have a glass of milk. 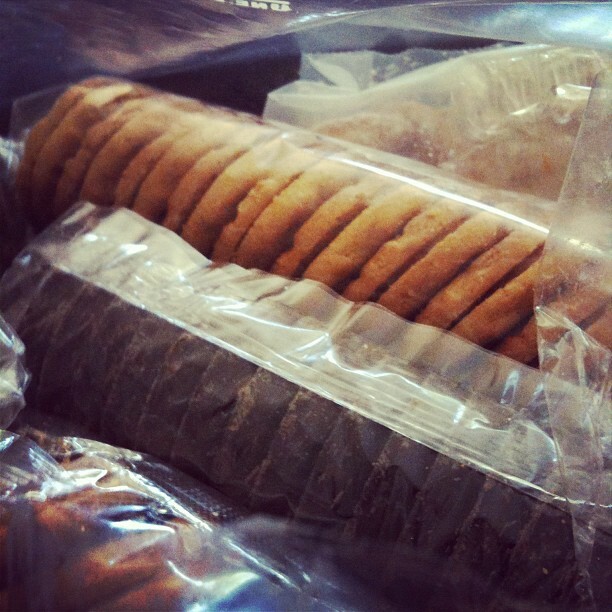 And maybe the other sleeve of cookies, since the box is already open. And that’s why I don’t order eight boxes. It’s also the reason that since its humble beginnings as a 1917 fundraising bake sale for the Mistletoe Scout Troop in Muskogee, Oklahoma, the sale of Girl Scout cookies has grown to staggering annual sales of over $700 million. Ten years after Juliette Gordon Low founded the Girl Scouts and just five years after that local cookie fundraiser in Oklahoma, Chicago Girl Scout leader Florence E. Neil put together an inexpensive cookie recipe for the organization’s magazine, The American Girl, encouraging local troops to sell the cookies to raise activity funds. And even though the original 1922 Girls Scout cookie recipe wasn’t the Thin Mint, the program flourished. In 1936 Girl Scouts started working with a number of commercial bakeries across the country to supply the growing demand for their cookies, which by 1951 came in three delicious varieties: Do-Si-Dos (peanut butter sandwich cookies), Trefoils (shortbread), and at long last, Thin Mints. Gradually, Girl Scouts consolidated their cookie sources and today the ones you buy because cute little girls are standing in the cold right outside your favorite grocery store and you suspect they might not be allowed to go home until their cookie table is empty, come from one of two commercial bakers. Each bakery is required by the Girl Scouts to produce the three varieties standardized in 1951, but then select five more varieties to offer every year. The recipes are similar between the bakeries, but not identical, and the names may be different as well. So, if like my husband, you for some reason just love Samoas (actually the second best seller in the catalog), don’t be too upset if you find you have to settle for a box of Caramel deLites instead. Thankfully, Thin Mints are always Thin Mints so there’s no confusion there, and I’m not the only one who likes them. As the top-selling Girl Scout Cookie, Thin Mints make up 25% of sales every year, most of them going to residents of my neighborhood. I am fortunate that even though my husband isn’t a big fan, my two sons enjoy them as much as I do, so I’ve managed to go through several packages by doling them out in lunch bags. I’ve mailed a couple more boxes in college care packages and I put the rest in the freezer. Sadly, that last solution doesn’t work out all that well, because the only thing tastier than a Thin Mint is a frozen Thin Mint. And the only thing tastier than that is a sleeve of frozen Thin Mints. I’m not thinking the last cookies are going to make it into lunches tomorrow. I wonder how the boys would feel about getting Samoas instead. Wow! $700 million? I knew these cookies sold big, but not THAT big. 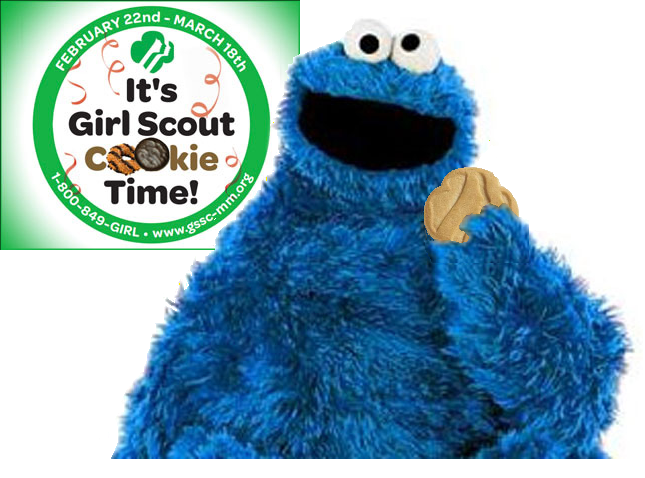 I love Samoas…and the Peanut Butter Patties….and the shortbreads…oh, man, now I crave cookies! Ha! My remaining Thin Mints didn’t last very long after I posted. Love the Monty Python reference. 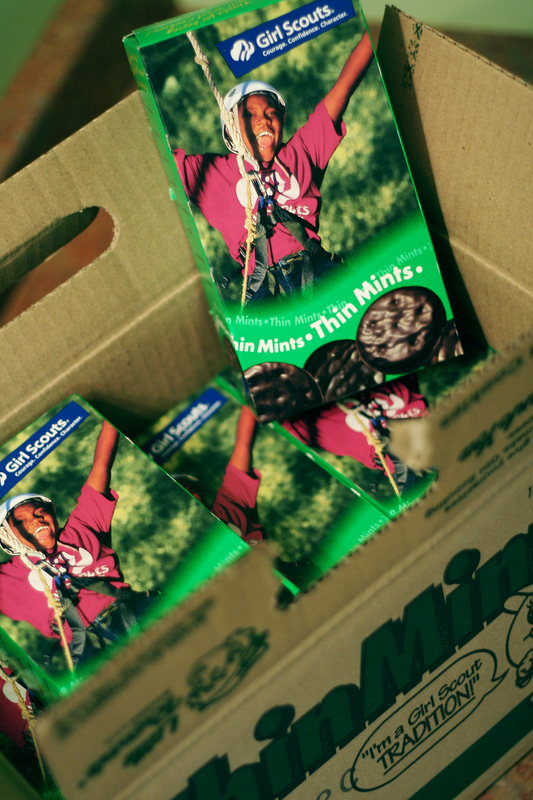 There is definitely always room for one more Girl Scout cookie; especially the Thin Mints! Oh this makes me laugh. You are not alone. My husband finally broke into his Samoas. I don’t understand. If he likes them so much, why doesn’t he scarf them down like I do? Weird. Enjoy your cookies!